2016 annual mean temperatures compared to historical temperature observations. See also maxima and minima. 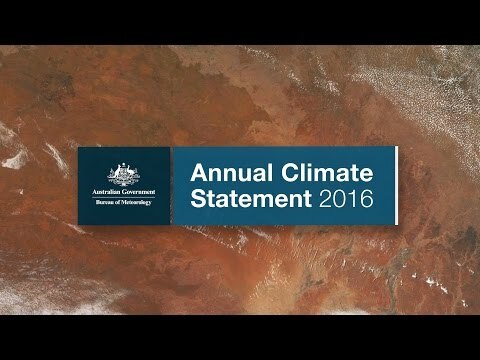 2016 was Australia's fourth-warmest year on record (the national observational dataset commences in 1910). Australia’s area-averaged mean temperature for 2016 was 0.87 °C above the 1961–1990 average. Maximum temperatures were 0.70 °C above average, and minimum temperatures were 1.03 °C above average. Minimum temperatures were the second-warmest on record behind +1.16 °C in 1998. The 11-year mean temperature for 2006–2016 was the second-highest on record at 0.56 °C above average. Only one year in the past ten was cooler than average (2011), and seven of Australia's ten warmest years have occurred since 2005. Sea surface temperatures (SST) in the oceans around Australia were also very warm during 2016, with the annual mean SST the warmest on record at 0.73 °C above average, surpassing the previous record of +0.64 °C in 2010. The warmth around the north and east coasts of Australia brought a record-warm year for several of Australia’s major cities. Darwin and Sydney had their warmest years on record for both maximum and minimum temperature, whilst Hobart had its warmest nights on record and warmest annual mean temperature, and for Brisbane the annual mean temperature was warmest on record. It was the equal third-warmest year on record for Canberra annual mean temperature. Perth had its coolest year since 2005. Adelaide was a little warmer than average, and most sites across metropolitan Melbourne were warmer than average for the year. The Australian climate in 2016 was influenced by a combination of natural drivers and anthropogenic climate change. The pattern of above average temperatures over land and in the oceans reflects the background warming trend. In the Pacific, the El Niño which had commenced in 2015 transitioned to neutral conditions during autumn 2016, and weak La Niña-like patterns over winter. In the Indian Ocean, water to Australia’s northwest continued to be warmer than average, and a strong negative Indian Ocean Dipole developed during the year. 2016 annual rainfall compared to historical rainfall observations. About deciles. Annual mean temperatures for 2016 were above to very much above average for the majority of Australia, and record warm for the tropics and parts of the east coast and southern Tasmania. Temperatures were cooler than average for an area of southwestern Western Australia. Australian mean rainfall for 2016 was 17% above the 1961–1990 average. 2016 was Australia's 15th-wettest year in a record spanning 1900 to present, with an area-average total of 544.99 mm—well above the average of 465.2 mm. Annual rainfall was above average for most of Australia, although below average for areas of the coast between the Gascoyne in Western Australia and Townsville in Queensland, and also for pockets of coastal southeast Queensland and northeastern New South Wales. Adelaide had its second-wettest year on record and its wettest since 1992. Sydney, Canberra and Hobart had above average rainfall, whilst Perth and Melbourne were close to average. Both Darwin and Brisbane were significantly drier than average for 2016. The estimated global mean temperature for 2016 (January–December) is 0.83 ± 0.09 °C above the 1961–1990 average. This surpasses the previous record set in 2015, and is the third year running that the new record has been set. Global annual mean temperature anomalies (as calculated from the 1961–1990 average), derived from a three-dataset mean. The World Meteorological Organization’s (WMO) estimated global mean temperature is based on the average of three global climate datasets: those maintained by the UK Met Office Hadley Centre (HadCRUT4), the US National Oceanic and Atmospheric Administration (MLOST) and the US NASA Goddard Institute of Space Studies (GISTEMP). Observations from these combined records commence in 1880. Globally, it was exceptionally warm throughout the year, with all months except May, June, September, October, November ranked warmest on record by each of the three datasets, and only October and November ranking outside the three warmest in each dataset. North America was warmest on record in 2016 by a substantial margin. Almost all global land areas were warmer than average in 2016. The global ocean surface temperature for the calendar year was also the warmest on record in 2016, surpassing the record set in 2015. No year since 1985 has observed a below average global mean temperature, and all of the ten warmest years have occurred between 1998 and the present. Warmth was persistent over Australia throughout 2016, with national average maximum temperatures cooler than average for only September and October, and minimum temperatures cooler than average for only October. Mean temperatures for each month from February to July were amongst the nine warmest on record for their respective months, with mean temperature anomalies ranging from +0.92 °C to +2.00 °C. Australian-averaged daily mean temperature anomalies, compared to the historical average. The black line shows the 11-year moving average. Annual mean temperatures were in the highest 10% of historical observations for much of northern Australia, an area of coastal southern New South Wales, and much of Tasmania, and above average for most of the rest of Australia. Mean temperatures were only cooler than average for an area of southwestern Western Australia. It was the warmest year on record for Tasmania, equal second-warmest for Queensland, fourth-warmest for the Northern Territory, fifth-warmest for Victoria and sixth-warmest for New South Wales. Maximum temperatures for the year were very much above average (in the highest 10% of historical observations) for northern Australia, the eastern seaboard, and Tasmania, and above average for most of the remainder of the eastern States and eastern South Australia. Maxima were the warmest on record for large areas of the far tropical north. Annual mean minimum temperatures were very much warmer than average (in the highest 10% of historical observations) over nearly all of Australia, and the warmest on record for Tasmania, most of Victoria and areas of southern to southeastern New South Wales, an area of western Queensland, and areas of northern Australia. Minima were near-average for southwestern Western Australia and the northern agricultural districts of South Australia. Following a warm summer, there were frequent warm spells during autumn. Autumn was marked by long runs of days with above average temperatures, as well as many record-high temperatures. A prolonged heatwave affected much of Australia during late February and the first half of March. The latter part of this heatwave contributed to Australia’s warmest March and warmest autumn on record. Winter was also warmer than average, with near-average temperatures over large areas during August, but temperatures in the highest 10% of historical observations over large areas in both June and July. Spring remained warm for the northern tropics, and record-warm during September. Elsewhere, however, below average temperatures were observed over large areas of southern Australia for September, and over eastern and central Australia for October. Nationally, the September mean temperature anomaly was −0.04 °C and the October anomaly was −0.50 °C. November saw a return to above average temperatures over much of Australia and December brought a warm finish to the year for the eastern States and South Australia. Rank ranges from 1 (lowest) to 107 (highest). A rank marked with '=' indicates the value is tied for that rank. National rainfall for 2016 was 17% above the 1961–1990 average, with an Australian annual total of 544.99 mm (the 1961–1990 average is 465.2 mm). Compared to rainfall since 1900 (117 years), this makes 2016 the 15th-wettest year on record, well above average. Australian monthly rainfall totals for 2016. The black line shows the 11-year moving average. Total annual rainfall was above average for most of Australia, but near-average to below average across much of the tropical north, northwestern Western Australia, and parts of the east coast from southeastern Queensland to the central coast of New South Wales. Rainfall for the year was in the highest 10% of historical observations for most of Tasmania and New South Wales inland of the Great Dividing Range, areas of northern and western Victoria, parts of agricultural South Australia, and very large areas of Central Australia extending from western Queensland, across the north of South Australia and south of the Northern Territory, and adjacent parts of central inland Western Australia. Annual rainfall was below average for the north of the Cape York Peninsula in Queensland, areas of the Top End and south of the Gulf of Carpentaria in the Northern Territory, areas along the northwest coast of Western Australia and on the coast of southeast Queensland and northern New South Wales. The 2015–16 northern wet season was the driest in more than 20 years, and the fourth drier-than-average wet season in a row. As well as infrequent and generally weak periods of monsoonal rainfall, the season saw far fewer tropical cyclones than average. There were only 3 tropical cyclones for the Australian region, as compared to the average of 11. This was the lowest number of tropical cyclones recorded for a season since satellite records began in the 1970s, and the only season on record without a single severe (category 3 or above) cyclone. Only a single tropical cycle (tropical cyclone Stan) crossed the Australian coastline, equalling the record for the least number of landfalls during a season. To date, the 2016–2017 tropical cyclone season has only seen one cyclone—Yvette, which had weakened to tropical low strength before making landfall near Broome on 25 December. January to April rainfall was below average for much of eastern Australia as well as for the north of the country. This dry start to the year saw the persistence of drought conditions across large areas of western and central Victoria, southeastern South Australia, Tasmania, and inland to central northern Queensland. As the 2015–16 El Niño broke down during autumn, and a negative Indian Ocean Dipole developed in May, conditions turned dramatically wetter. After Australia’s ninth-driest April on record, May came in as sixth-wettest. Very much above average rainfall continued during winter and spring, providing relief from prolonged dry conditions which were widespread earlier in the year in Queensland and southeastern Australia. Satellite imagery shows that the wet and warm southern growing season has been associated with significant grass growth in 2016. The conditions have also been favourable for crop production, with ABARES forecasting a record breaking wheat crop for 2016. Historically, increased wheat production is strongly associated with those years experiencing mild and wet conditions and a negative Indian Ocean Dipole. June and September were exceptionally wet, both second-wettest on record for their respective months. Winter was the second-wettest on record, with just over half of Australia receiving rainfall totals in the highest 10% of historical records for the June–August period. The only region to experience below-average rainfall during winter was southwest Australia, where the long-term rainfall decline is the dominant factor. May to September was also the wettest May–September on record. Rainfall for October was near-average over much of Australia but below average over large areas of southern and eastern Australia for November. A tropical low at the end of the year brought very much above average December rainfall across South Australia, the Northern Territory and the east of Western Australia. Rank ranges from 1 (lowest) to 117 (highest). A rank marked with '=' indicates the value is tied for that rank. The year commenced with one of the three strongest El Niños on record already underway in the central Pacific, and record-warm waters across much of the Indian Ocean. Ocean warmth continued to be a key feature of 2016, with warmth persisting in the Pacific following the breakdown of El Niño during May, and remaining record or near-record warm throughout the year around northern Australia. The combination of El Niño and ongoing climate change led to record warm temperatures globally during 2016, as they did in 2015. Below average rainfall over much of eastern Australia during the first four months of 2016 was consistent with historical El Niño-driven rainfall patterns. Beginning in May, Australia experienced significantly above average rainfall. Australia often experiences above average rainfall during the months following the breakdown of a moderate-to-strong El Niño, and in 2016 this tendency was reinforced by a strong negative Indian Ocean Dipole (IOD) which developed in late May. The negative IOD event peaked in July with the largest negative value of the IOD index since reliable records started in 1960 (based on ERSST v4 data), and the eastern node of the IOD (around and south of Indonesia) was the second-warmest on record for September. In addition to the negative IOD, the Pacific Ocean experienced La Niña-like patterns during the second half of the year, with a number of climate indicators approaching La Niña levels during spring. Ultimately, however, a La Niña did not eventuate, and the tropical Pacific Ocean remained El Niño–Southern Oscillation (ENSO) neutral (neither El Niño nor La Niña). This combination of a negative IOD, very warm waters north of Australia, and a La Niña-like Pacific Ocean was associated with the wettest May to September period on record for Australia. The negative IOD began to weaken in October and had dissipated by late November, bringing a return of more average rainfall patterns in Australia. 2016 sea surface temperatures compared to historical records. (From the NOAA Extended Reconstructed Sea Surface Temperature dataset, ERSST v4). Sea surface temperature regions map and about deciles. Sea surface temperatures (SSTs) have warmed substantially around Australia, and have been persistently high in recent years. The 2016 SST anomaly for the Australian region was the highest on record (since 1900), 0.73 °C above the 1961–1990 average, based on ERSST v4 data. For the globe as a whole, sea surface temperatures were the highest on record, with an anomaly of 0.58 °C (this was 0.09 °C above the record set in 2015) based on values from the NOAA Extended Reconstructed Sea Surface Temperature Version 4 (ERSST v4) dataset, which commences in 1854. The El Niño, in combination with background global warming, led to record-warm SSTs around much of Australia during the first half of the year, including in the Coral Sea and to Australia’s northwest, where widespread coral bleaching was observed. The bleaching event in the northern part of the Great Barrier Reef was the worst on record, affecting some 1000 km of reef north of Lizard Island, while in Western Australia it was the third time a bleaching event has ever been recorded. SSTs were also record-warm around Tasmania and across parts of the Tasman Sea during the first half of 2016, driven by a southward extension of the East Australian Current. This was associated with the longest and most intense marine heatwave on record for the southeast Australian region. SSTs remained in the highest 10% of historical records across waters to Australia’s north and east throughout the second half of the year, although the areas which were warmest on record for their respective months were much smaller. From August onwards an area of water around the southwest of Western Australia experienced cooler than average SSTs, with a large area very much cooler than average (SSTs in the lowest 10% of historical observations) during September and October. Cool water in this region resulted from very warm water south of Indonesia setting in place an atmospheric circulation which drew southwesterly winds over southwest Western Australia. This effect can also be seen in cooler than average temperatures in southwest Western Australia across much of the year. For the Australian region as a whole, SST anomalies for each month from January to July were the highest on record for their respective month. March was not only the warmest March on record, the monthly anomaly was the largest on record for Australian region SSTs for any month of the year. Similarly, all of the months January to July 2016 were not only the warmest on record for their individual month, but together made up the seven largest positive anomalies on record for any month of the year. Ocean warmth around the north and east of Australia persisted during the second half of the year, with the months August to November amongst the top ten warmest for their respective months. December was also warmer than average, but not within the top ten. Above average annual SSTs have been observed for the Australian region in every year since 1994. There has been a total increase of approximately 1 °C since 1900, very similar to the increase in temperature observed over land. Annual mean sea surface temperature anomalies in the Australian region (as calculated from the 1961–1990 average). Bushfires which caused extensive property damage near Wye River on the Great Ocean Road in Victoria during late December 2015 continued during the first half of January, burning 2500 ha of land in the Otway Ranges. Two separate small fires destroyed one house and severely damaged another at Cribb Point on the Mornington Peninsula on the 18th and destroyed one house and 100 ha of grass on the 19th at Edgecombe in central Victoria. Lightning ignited a bushfire at Lane Pool Reserve, near Dwellingup in southwest Western Australia, on the morning of 6 January. The fire caused extensive destruction around Waroona and resulted in more than 69 000 ha of land burnt and over 180 properties lost, mostly in Yarloop. Two people were killed and four firefighters injured. It was Western Australia's most destructive bushfire in 50 years. See the Waroona Bushfire Special Inquiry report. A tropical low originating over Darwin in the last week of December brought flooding rain to western and central Queensland over the first four days of January, with extensive flooding in the Gulf Country, Central West, Channel Country and parts of the Maranoa and Warrego districts. Kati Thanda – Lake Eyre experienced significant inflows from the event, in large part due to locally heavy rainfall in the immediate vicinity. Some areas to the east of Kati Thanda-Lake Eyre had exceeded their average annual rainfall in just the first few days of the year. The tropical low that tracked from the Northern Territory through Queensland in the first days of January developed into an East Coast Low, producing heavy rainfall along the east coast of New South Wales during 4–7 January. Flooding in several rivers in the Hunter region resulted, with the evacuation of parts of Raymond Terrace and Dungog, 33 flood rescues, and more than 2000 calls to the SES. Thunderstorms produced very heavy rain in central northern Victoria on 4 January, resulting in flash flooding. Some sites received more than their average January rainfall in one day. There were over 170 calls to the SES for assistance, mainly for fallen trees, minor building damage and cars trapped in water. One man perished at Seymour in central Victoria when his vehicle was washed away while attempting to cross a flooded bridge. The passage of a cold front brought a gusty change following a very hot day on 13 January, raising dust from drought affected parts of western Victoria. Strong winds were recorded in northwestern Victoria and around Melbourne resulting in widespread power outages and 400 calls to the SES for fallen trees and minor building damage, mostly in Melbourne's outer east and northeast. Thunderstorms in the last week of January brought heavy rain to Melbourne and surrounds. Exceptional rainfall caused flash flooding in Geelong on the 27th, disrupting rail services and damaging around 150 homes. Further storms over the last days of the month saw flash flooding, large hail at Packenham and Belgrave (in Melbourne’s southeast), and a suspected tornado in Reservoir (in Melbourne’s northeast) on the 30th. There were 770 calls to the SES over the week for damaged roofs, smashed windows, flash flooding, and 18 flood rescues in Geelong. There were a number of damaging storms in New South Wales during January. Thunderstorms produced severe wind gusts in the Sydney region on the 14th, reaching 120 km/h at Sydney Airport. The SES received more than 2500 calls for assistance with fallen trees and damage to roofs. Very strong winds were reported in the Mid North Coast and Hunter districts on the 22nd, with downed trees and property damage in Bowraville, Greta and Singleton. A wind gust of 135 km/h was also reported at Tibooburra in northwestern New South Wales on the same day. Golf-ball sized hail was reported at Tuggeranong in the Australian Capital Territory on the 25th. Thunderstorms produced strong winds, heavy rain and local flash flooding in the Sydney region on the 29th and 30th, with damage to buildings and powerlines. Major property damage was also reported in Forbes Creek and Palmers Island. A cutoff low brought exceptional rainfall to northeastern Tasmania during the last week of January, breaking daily rainfall totals at some locations. Rainfall totals exceeded 100 mm over most of the east coast and central north of Tasmania. Widespread flash flooding occurred on much of the east coast and in parts of the central north, particularly around Launceston. Following very low rainfall during 2015, a large number of fires were ignited in northwestern Tasmania by lightning associated with storms crossing the State on 13 and 14 January, with further lightning ignitions following on the 28th. The fires were large and fierce, with smoke at times spreading as far as Hobart and southern Victoria. The passage of a strong cold front and associated wind change on 15 February saw some fires increase, and while rain on 25 February extinguished some fires, about 25 fires still burned at the end of the month. By the end of February, approximately 123 800 ha of vegetation had been burnt, mostly forest in remote areas including 19 000 ha of Tasmania’s World Heritage wilderness area. Tropical cyclone Stan developed north of Port Hedland in Western Australia on 29 January, intensifying into a category two system before making landfall east of Pardoo early on the 31st. Stan weakened to a tropical low over the eastern Pilbara and tracked over southeastern Western Australia at the start of February. Heavy rain fell in the Gascoyne, Fortescue and De Grey catchments, with moderate to major flooding in the upper De Grey catchment including the Oakover, Coongan and Nullagine rivers. The remnants of ex-tropical cyclone Stan crossed the Nullarbor in early February, then tracked southeastward across southern South Australia and western Victoria, bringing heavy rain. There was flash flooding at Port Lincoln and Victor Harbor as totals of 40 to 80 mm were recorded in less than three hours in parts of the Nullarbor, southern Eyre Peninsula and the Fleurieu Peninsula. Tropical cyclone Tatiana was named over the northwest Coral Sea in the afternoon on the 11th. Tatiana tracked south and remained well offshore before dissipating on the 15th. Beaches in southeast Queensland experienced some powerful, long-period swells. Tropical cyclone Uriah developed west of the Cocos Islands on the evening of the 13th, and moved southwest into the La Reunion region on the evening of the 14th. Some minor damage, such as road erosion and fallen trees, occurred in the Cocos (Keeling) Islands. The number of tropical cyclones for the Australian region during the 2015–16 season was three. This is the lowest number of cyclones recorded in a season since satellite records began in 1970, and the only season in which no cyclone reached severe intensity (category 3 or above). On 23 February a 1300 ha grass and scrub fire at Mount Bolton, northwest of Ballarat, destroyed two houses and some buildings and fences, while another fire near Somerville in the Frankston area damaged the Stony Point train line, causing disruptions to services. Golf-ball sized hail was reported in Queanbeyan and the Australian Capital Territory on 11 February, causing damage to houses and vehicles. Severe thunderstorms in the Sydney and Hunter regions produced strong winds, large hail and heavy rain on 20 February. Wind gusts reached 133 km/h at High Range (Wanganderry). At least five light planes and several buildings were destroyed at Camden Airport, and there were reports of uprooted trees near The Oaks and Cobbity. A prolonged heatwave affected much of Australia during late February and the first half of March. Weak monsoon rainfall over northern Australia led to a build up of heat during the second half of February. By the first week of March this heat had extended to cover almost all of Australia. Abnormal heat persisted in the southeast until temperatures were moderated by the passage of a trough during 9–10 March, but it was not until a southwesterly change on the 18th, associated with a low pressure system near Tasmania, that cool temperatures ended the sequence. Numerous daily high temperature records were set for February and March during the event. Between 6 and 14 March South Australia received heavy rain from thunderstorm activity associated with a series of broad surface troughs and upper level disturbances, with some areas receiving totals between 50 mm and 150 mm across the nine days—more than twice the monthly average rainfall. Many outback roads were closed and Kati Thanda – Lake Eyre received significant inflows. A trough and cold front brought severe thunderstorms and strong winds, with gusts to over 100 km/h, across Victoria on 18 and 19 March. The SES received 450 calls across the State, with damage concentrated in northeastern Victoria and around Melbourne. Thousands of homes around Melbourne had blackouts, and train cancellations led to significant commuter delays. On 3 March hail up to 3 cm in diameter fell at Bungendore and St George in southeastern New South Wales, causing damage to cars. Wind gusts over 90 km/h at Wagga Wagga damaged several properties, and people were rescued from two cars washed into flood waters near Sutton. Storms were frequent during March, with one causing power outages for more than 5000 homes in Sydney on the 14th; a cold front bringing wind gusts above 100 km/h to several locations including Griffith and Forbes, with reports of uprooted trees in Canberra on the 18th; and winds which felled tree limbs and partly removed a roof near Grafton on the 26th. Tropical cyclone Winston caused great destruction in Tonga and Fiji but was an ex-cyclone upon reaching the Australian region. The remnant low brought significant rainfall to Queensland's north, west, and central coast in early March while a separate tropical low brought heavy rainfall to catchments in the Gulf Country in the middle of March. Moderate flooding in the Georgina and Diamantina River catchments in western Queensland began in March and persisted into April as floodwaters continued travelling downstream towards Kati Thanda – Lake Eyre. A cold front with embedded thunderstorms crossed the southeast during 30 April to 3 May. Strong winds caused power outages at 5000 premises across Adelaide, mainly in the southern and western suburbs. The winds also caused damage and power outages across Tasmania, especially in the northwest, with gusts over 100 km/h at several sites, including 130 km/h at Maatsuyker Island and 144 km/h at Hogan Island. A rough passage caused damage to vehicles and cargo on the Spirit of Tasmania as it crossed Bass Strait. Up to 15 000 homes and businesses lost power in Melbourne and South Gippsland. The Victorian SES received 2200 calls for help, with the worst affected areas in Melbourne's east and southeast. A large, intense low pressure system crossed the Great Australian Bight during 8 and 9 May, bringing strong and damaging winds to the Eyre Peninsula and northern agricultural districts of South Australia. A significant storm surge combined with spring high tides caused exceptionally high water levels and sea-water inundation in coastal areas, coastal erosion, and damage to infrastructure. The South Australian SES responded to over 1000 calls for assistance. Between 9 and 19 May the passage of several cold fronts and persistent, strong westerly flow brought high winds to Victoria and Tasmania on multiple days, including a gust to 159 km/h at kunanyi / Mount Wellington on the 11th. Numerous sites in central and northeast Victoria received their highest daily rainfall on record on the 9th or 10th. Several buildings were damaged in southern Tasmania, with storm damage also reported in the northwest of the State. Another burst of strong winds in Tasmania on the 19th, with gusts well over 100 km/h at coastal and mountain sites, accompanied abnormally high tides, leading to further difficulties in some areas, including flash flooding, coastal erosion and swollen rivers. The passage of a strong cold front across Western Australia on 21 May caused widespread damage and power outages, and a storm tide peaking at about 65 cm above astronomical high tide at Busselton, and around 50 cm above astronomical high tide at Barrack Street in the Perth CBD. The DFES received 560 requests for help. During the first week of June an East Coast Low developed over the Tasman Sea, coinciding with record-high sea surface temperatures. The East Coast Low interacted with an extensive upper level trough over eastern Australia and a high pressure system over New Zealand, and extended its influence from southern Queensland to northern Tasmania. Damaging winds, large waves, coastal erosion, and very heavy rainfall resulted between the 4th and 7th, causing flooding in areas of southeast Queensland, eastern New South Wales, eastern Victoria, and large areas of northern Tasmania. A number of June daily rainfall records were set, in southeast Queensland and eastern New South Wales. High daily rainfall records and high minimum temperature records for June were set in Tasmania. Major riverine flooding and flash flooding occurred across all river basins in northern Tasmania, and some rivers in the south, as a persistent and very moist northeasterly airstream delivered exceptionally heavy rain over several days across northern districts, with daily totals in excess of 200 mm in the 24 hours to 9 am on the 6th. Some sites broke long-standing flood records from 1929 and 1970 and there was extensive damage to infrastructure. Two people were confirmed dead and one missing. More detail on resultant damage in Tasmania can be found in the Monthly Weather Review. The New South Wales SES responded to over 10 000 calls and natural disasters were declared in 41 Local Government Areas. Significant coastal erosion occurred along several stretches of beach, including damage to several homes and public buildings in Collaroy. A broad upper level trough produced areas of rain and thunderstorms in southwest Queensland on 17 June, before intensifying and delivering widespread rain in inland New South Wales and central and southern Queensland on the 18th, and producing flash flooding in parts of southeast Queensland on the 19th. The trough subsequently deepened into an East Coast Low on 20 June, bringing heavy rain to eastern parts of New South Wales and Victoria. The New South Wales SES received 1200 calls for assistance, with 11 flood rescues as the rain caused additional flooding, notably in Ungarie where parts of the town were evacuated. As the East Coast Low decayed it brought further rain to Tasmania between 20 and 25 June. The already wet catchments responded rapidly, with minor to moderate flooding, particularly around the Launceston region. Significant thunderstorms occurred in the Alice Springs region on 17 June, with golf-ball sized hail reported in the area. Hail is an unusual occurrence in central Australia. Early in the afternoon of 21 June a band of heavy showers associated with a cold front moved through the southern suburbs of Adelaide. One storm spawned a tornado which toppled trees and caused roof damage to seven homes along a 3.5 km path in Hallett Cove and Reynella. A low pressure system and associated cold fronts crossed southern Australia between 9 and 13 July, bringing strong winds to large parts of Tasmania, South Australia, Victoria and New South Wales. Strong winds continued in Tasmania until the 15th, with the strongest wind gust reaching 165 km/h at kunanyi / Mount Wellington on the 14th. This resulted in widespread damage, with downed trees and powerlines leading to road closures and property damage across four States and widespread power outages, including to over 120 000 premises in South Australia and 14 000 premises in Tasmania, and more than 1000 calls for assistance to the SES in South Australia alone. The cold front also brought very cold weather to southeastern Australia between 11 and 13 July, with snow falling to sea level in southern Tasmania, and settling below 200 metres in some areas with closures or restrictions on many high elevation roads. Widespread snow to low levels was also reported in Victoria, including the Otways, higher parts of the Dandenong ranges outside Melbourne, Mount Macedon, Wonthaggi, Ararat and Ballarat, light cover across most of Canberra, and snow flurries at Mount Lofty in South Australia. There was heavy snow in alpine regions of Victoria and New South Wales, with snow depth at Spencers Creek increasing by 44 cm between the 6th and 14th. A series of cold fronts crossed southeast Australia during 22 to 25 July, causing strong and gusty winds across Tasmania, South Australia, Victoria and much of New South Wales. Exposed and elevated sites in Tasmania and Victoria recorded wind gusts well in excess of 100 km/h. There were in total around 400 calls for assistance to the SES in Victoria. A tornado also caused tree and house roof damage along a narrow 2.7 km long track through the Adelaide suburbs of Somerton Park and Glengowrie on the 25th. In a cold airstream behind the fronts, snow fell to low levels in Tasmania, settling below 200 m in some areas and leading to the closure of some highland roads. Heavy falls in the Australian Alps saw snow depth at Spencers Creek increase by 73 cm during the week. In southwest Queensland the Diamantina and Thomson rivers reached moderate flood levels following heavy rainfall in their headwaters in the middle of July. Flooding continued during August as flood waters progressed downstream. Further heavy falls caused renewed flooding, expanding to include the Bulloo and Warrego catchments during early September. A succession of troughs brought widespread rainfall to much of western and southern Queensland during September, resulting in renewed river level rises across catchments already in flood, and extending the flood affected area to include the Georgina, Eyre, Thomson, Barcoo, Cooper, Paroo, Wallam, Maranoa, Balonne, Moonie, Weir, Macintyre and Dawson catchments. Numerous roads in western and southern Queensland experienced prolonged closures and diversions, many of which were still in place at the end of September. Between 9 and 14 August a series of cold fronts embedded in westerly flow caused a very windy period for parts of coastal and elevated South Australia, Victoria and Tasmania. A deep low pressure system and associated cold front passed to the south of Tasmania during 18 and 19 August, bringing damaging northerly winds to South Australia and Victoria. The SES received about 100 calls for assistance in South Australia, and 55 calls in Victoria. Gusts in excess of 100 km/h were recorded at a number of exposed and elevated sites in Victoria and Tasmania during both events, and also in coastal South Australia during the earlier period. A surface trough drew very warm, moist air into northern New South Wales and bordering regions of Queensland between 22 and 25 August. Heavy rain broke records at some stations in northeast New South Wales on the 24th and caused minor flooding in New South Wales in the Severn and Lower Macintyre rivers. There was also flash flooding, with several flood rescues and one fatality reported when a car was washed from a causeway. Freezing temperatures caused significant frost damage to crops in parts of the South West Land Division of Western Australia during mid-to-late September. A record-wet September led to recurrent and widespread flooding throughout the month, which in many places persisted into October as flood waters progressed downstream and rainfall continued, particularly during the first week of October. The flooding affected broad areas and many daily rainfall records were set during the month; more complete details may be found in the Special Climate Statement and the Monthly Weather Reviews for September and October. The very wet period also caused difficulty in agricultural regions, with soils too wet for farm machinery in some areas limiting ability to harvest and plant, in addition to crop losses directly from excessive rain or flooding. Potatoes and milk particularly suffered reduced availability. Flooding on the Glenelg River peaked at 6.1 m in Casterton around 4:30 am on 11 September, flooding several premises and isolating up to 40 more. Coleraine also experienced flooding, affecting eight homes and six businesses. In Wallacedale, south of Hamilton, one person drowned when their ute was washed away on 14 September. The Victorian SES received 1500 calls for assistance between 9 and 19 September, performing more than 20 flood rescues. 13 schools and 238 roads were closed at some point during September or October, with 25 Local Government Areas affected and parts of some towns subject to evacuations. During September there was also minor flooding around Ballarat and the Grampians, minor flooding in Albury, and landslides along stretches of the Great Ocean Road between Eastern View and Lorne. Flooding continued along the Murray and other border rivers during October, with the Edward River, a secondary channel of the Murray, reaching its highest flood levels since 1975 at Deniliquin and Moulamein. Flooding on the Ovens River isolated Bright in October when the Great Alpine Road was cut while landslips and fallen trees blocked the Bogong High Plains Road between Falls Creek and Mount Beauty. In Charlton the Avoca River peaked at 7.23 m overnight on 6–7 October, while the Loddon River peaked at 7.09 m on the evening of the 6th. The Lachlan River reached a level of 10.67 mat Forbes Iron Bridge on 25 September, the highest flood peak since 1952. Evacuations were ordered in parts of Ungarie and Forbes, with floodwaters affecting close to 1200 people across 350 properties, while more than 100 properties were damaged. In addition to the Lachlan River, flooding in September affected the Murrumbidgee, Macquarie and Bogan rivers. Flooding in October again affected parts of these rivers, and also the Murray, Barwon–Darling, Warrego, Belubela and Peel rivers, with minor flooding in the Paroo and Macintyre. Natural Disasters were declared for 36 Local Government Areas. There were widespread road closures and significant isolation of rural properties, and evacuations were ordered in some low-lying parts of Forbes, Condobolin, Willow Bend, Wagga Wagga, Moulamein, and Tumut. The New South Wales SES received over 5500 requests for assistance during September and October and performed a total 143 flood rescues, including animal rescues and medical transports. Heavy rain during 14 and 15 September brought flash flooding to parts of the Mount Lofty Ranges and metropolitan creeks, the worst since November 2005. There was also riverine flooding in the Onkaparinga River. There was significant damage to infrastructure including undermining of roads and flood damage to about 80 homes, with a further 20 houses in Old Noarlunga damaged by releases from Mount Bold Reservoir in response to the rain. Moderate to locally heavy rainfall across the central districts of South Australia during 29 September and the early hours of the 30th led to flooding in creeks and rivers across the region. Significant flooding continued along the Gawler River downstream from Gawler on 1 October. Rainfall between 2 and 4 October led to renewed river rises and further flooding in the Onkaparinga, Torrens and Gawler river catchments. Rainfall across much of Tasmania on 15 September led to significant river rises, with minor flooding in the St Pauls and Macquarie rivers. Heavy rain on 30 September set several September daily rainfall records and caused flash flooding and rapid river rises in several catchments including the Macquarie, North and South Esk, Huon, Derwent, Meander and Jordan. The Jordan River at Mauriceton peaked at 2.75 m, the highest since November 1975. About 40 properties were affected by flooding, including 17 residences in Huonville. The Macquarie River at Cressy peaked on 2 October at the fifth-highest level since records began in 1985, inundating large areas of agricultural land. Later in October further rainfall in already saturated catchments led to renewed minor flooding in the Macquarie, Huon and River Derwent catchments. During the afternoon of 28 September an outbreak of severe thunderstorms developed in central South Australia along the line of a strong cold front linked to an intense low pressure system tracking east across the Bight. A record-low mean sea level pressure of 972.7 hPa was observed at 0300 CST on the 29th at Neptune Island off the south coast of South Australia, the lowest pressure known to have been observed at a standard observation time at a South Australian station. Damaging to destructive winds were observed across large areas, including at least seven tornadoes, large hailstones up to 5 cm in diameter and locally intense rainfall. The eastern Eyre Peninsula, Flinders and Mid North districts of South Australia bore the brunt of the storms and electrical transmission towers were brought down in four separate locations, contributing to a statewide power outage. As well as damage to transmission towers and houses, multiple regions experienced crop damage from heavy rain and large hail, several areas reported flash flooding, and there was wind damage to trees and property. Strong to gale force west to southwesterly winds and localised severe convective squalls continued into the morning of the 29th, causing further damage. The sustained winds and very low atmospheric pressure also produced a substantial storm surge in the Spencer Gulf, and to a lesser extent in Gulf St Vincent. The combination of high sea levels and very rough seas resulted in significant coastal sea water flooding and damage to coastal infrastructure, particularly along the eastern shores of Spencer Gulf. Victoria experienced damaging winds in early October associated with storms previously affecting South Australia, followed by another six major storm and/or wind events during the month. Disaster assistance was available in 48 councils across Victoria affected by floods and storms. Strong and gusty winds also affected Tasmania several times during October. See the October Monthly Weather Review for full details. A series of cold fronts linked to an intense low tracked across the southeast between 2 and 4 October. Associated storms, heavy rain, and strong winds uprooted trees and caused some building damage and network delays to metropolitan trains and one major arterial tram route. The SES received 500 requests for assistance while some flooding was reported at Carisbrook near Maryborough, in Ballarat, and some north-central and northeastern parts of the State. Winds were strongest in Tasmania on 5 October; Maatsuyker Island registered a gust to 159 km/h during the afternoon as the front passed. This is Australia's strongest October gust recorded in the climate database. On the 9th kunanyi (Mount Wellington Pinnacle) recorded a gust to 156 km/h, becoming the equal-second strongest October gust for Australia. On 9 October Victoria’s northwest experienced very strong winds with the passage of a cold front across southeast Australia, ending an early season heatwave. The Victorian SES, CFA and MFB collectively received more than 5220 calls for assistance following extensive damage over large areas and blackouts affecting more than 120 000 premises, with some outages lasting multiple days. At least 20 people were taken to hospital on the 9th and a woman perished when a tree fell on her Millgrove home, while two other people were seriously injured by trees falling onto houses in Badgers Creek and Tecoma. Severe thunderstorms affected central New South Wales overnight on 21–22 October, causing strong winds, hail, and flash flooding. The damage was most significant in Parkes and Young, where the SES received 128 requests for assistance. Hail of up to 4 cm diameter also broke windows in Parkes, with reports of a tornado flattening trees. The storm caused major damage to crops in parts of the central west. A strong cold front and developing low pressure centre to the southwest of Tasmania brought strong winds near between 29 and 30 October. The SES responded to more than 350 calls for assistance in Victoria, mostly in the southwest, and to 100 requests in South Australia. 7500 Victorian properties lost power, mostly around Ballarat, but also in the State’s east and Melbourne’s southeastern suburbs, while 1200 properties lost power in South Australia. A lightning strike in late September ignited a bushfire in the Kimberley in Western Australia. By late October around a million hectares had been burnt, affecting several cattle stations. A cold front produced heavy snow in alpine regions at the start of October, with snow depths at Spencer's Creek (1830 m) increasing by 48.2 cm between 27 September and 6 October. This is one of the largest snowfalls on record so late in the season, and contributed to total snow depths remaining above 1 m throughout October. Depths did not drop below 1 m until 2 November—the latest end to the season since 1992. Severe weather was experienced between 10 and 13 November as very hot conditions in central Australia gave way to a cold front crossing the southeast. The cold front connected to a surface trough stretching through eastern South Australia to Alice Springs. Severe storms formed in association with the change, producing golf-ball sized hail in some areas, very heavy rain, and strong winds, affecting South Australia, Victoria, New South Wales, and Queensland. Extensive crop damage occurred around Mildura, including to wine grapes, almonds, stone fruit and wheat, and blackouts affected more than 21 000 premises in the region. A suspected tornado was also observed at Merbein. Property damage was recorded, with the Victorian SES responding to 430 calls for assistance; 380 of which were in the Mildura area. Insured losses were reported at $115 million, but many crop losses were uninsured so the actual value of losses will be much higher. These storms also affected the Broken Hill area in far southwestern New South Wales, producing wind gusts of 100 km/h, localised flash flooding, and 5 cm hail. The storm caused widespread damage including downed trees and powerlines, broken windows and skylights, damaged roofs, and dented cars, with over 100 calls to the SES and power outages reported affecting 12 000 premises. This was followed by wind gusts of 128 km/h and 2 cm hail in the Narrabri/Tamworth area on the 12th, with the SES reporting 200 jobs from wind damage in the area. Thunderstorms developed late in the afternoon of the 10th in the far north of South Australia, with further storms forming during the morning of the 11th over the Eyre Peninsula, reaching Adelaide around 4:30 pm CSDT. There were reports of golf-ball sized hail in northern and eastern suburbs, resulting in significant vehicle damage. Hail of around 2 cm was and short bursts of heavy rain recorded through many other parts of the Adelaide metropolitan area. Elsewhere across the State there was widespread thunderstorm activity over central and eastern districts with a focus of severe thunderstorms on and east of the ranges. Large hail of around 3 to 6 cm and damaging winds were reported at several locations, with significant damage to agricultural land in parts of the Riverland. Winds continued in southern South Australia on the 12th on the northern and western flanks of the intensifying low pressure system. Naracoorte recorded mean winds of 50 to 60 km/h for much of the day and briefly reached gale force (63 km/h) during the afternoon. The storms delayed or diverted some flights at Brisbane Airport, while damage was reported around Condamine Plains, west of Toowoomba. Damaging wind gusts up to 107 km/h were also observed at Winton in central Queensland. A low pressure centre deepened on the line of the front, bringing moist tropical air and heavy rain in Tasmania from the 12th to the 14th as the low crossed Bass Strait. Some sites had their highest November daily rainfall on record, many sites recorded over 100 mm, and Gray reported 263.8 mm over the three days to 9 am on the 14th. Play in an international cricket match in Hobart was abandoned on the 13th due to rain, and the Point to Pinnacle half marathon in Hobart was changed to only go halfway to the summit of kunanyi / Mount Wellington. There was moderate to locally major flooding in the South Esk and Macquarie rivers. Two men were rescued from floodwater by helicopter. Several bushfires burned in eastern parts of New South Wales during November. More than 40 fires were burning on the 8th, with fires disrupting traffic near Lake Macquarie. In western Sydney, a 300 ha fire in Llandilo destroyed a home on the 4th and damaged several properties. A 400 ha fire near Londonderry over the 13th to 14th threatened houses and blocked roads as well as injuring a firefighter. A grassfire of around 350 ha burned on 21 November near Swan Hill in Victoria's northwest, with a number of other small fires ignited by lightning across northern Victoria on the same day. The Swan Hill fire was brought under control just after 9 pm, however a fire truck was severely damaged when it was caught in a burn-over earlier in the day. Fortunately the crew accompanying the truck escaped serious injury. The strong and gusty change following the lightning storms also caused damage across parts of Victoria during the afternoon, with the SES receiving 350 calls for assistance and about 5000 premises in Melbourne’s bayside suburbs experiencing blackouts. These storms also led to an extreme thunderstorm asthma event in Melbourne during the evening. Hot, dry northerly winds ahead of the change contributed to a high pollen count, mostly from rye grass on the plains to the north and west of Melbourne. It is thought that moisture causes the pollen grains to break apart into particles small enough to penetrate the lower airways, facilitating the asthmatic reaction. Victorian Department of Health and Human Services spokespeople have attributed eight deaths to the asthma event. More than 8500 people presented at hospitals across Melbourne and there were about 1900 calls for an ambulance between 6 pm and 11 pm, nearly seven times the number typically received for this five-hour period. Severe thunderstorms developed around Warwick on the Darling Downs on 18 December, moving east-northeast and affecting Boonah before tracking through western suburbs of Brisbane. Wind gusts up to 100 km/h were recorded at Amberley. Heavy rainfall was recorded in and around Ipswich, causing flash flooding, while hail up to 4.5 cm in diameter was reported in suburbs around Redbank, between Ipswich and Brisbane. Roof damage, uprooted trees and structural damage was also reported in western suburbs. Tropical cyclone Yvette was named on 21 December while well offshore of Western Australia. It remained at category 1 strength during the next day, but weakened to tropical low strength before making landfall near Broome on the 25th. The system was associated with areas of heavy rainfall over the Kimberley before landfall, assisted by another tropical low closer to Darwin, with minor to moderate flooding resulting in some areas. This low pressure complex then tracked into Central Australia where it was associated with 1-in-50 year rainfall and resultant severe flash flooding around Uluru, closing the Uluru-Kata Tjuta National Park. Evacuations were ordered in parts of Kintore after 232 mm of rain fell in the 24 hours to 9 am on the 26th, and a search and rescue was mounted for groups of tourists stranded by floodwaters. Storms continued as the system tracked from South Australia to Bass Strait, before being overtaken by a strong low and associated cold front moving southeastward from the Great Australian Bight during the 28th and 29th. Storms in South Australia on the night of the 27th caused widespread power outages and damage to orchards in the Adelaide Hills as well as flash flooding in the hills and metropolitan region. The South Australian SES received more than 1000 calls for assistance, mostly with fallen trees, and the roof of a Glenelg Oval grandstand was removed by the storm. Subsequent storms occurred in and around Melbourne on the afternoon of the 29th resulting in areas of flash flooding, some riverine flooding as creeks and the Elwood Canal broke their banks, extensive storm and water damage, and disruptions to road and rail travel. The Victorian SES received 1800 calls for assistance, mostly for flooding and water damage. Some pockets of the city received 1-in-100 year rainfall and Viewbank received 40 mm in 15 minutes, amongst the highest recorded rain rates in Victoria. The low pressure system also brought localised heavy rain and thunderstorms to Tasmania on the 29th and 30th, with some flash flooding. The event was also associated with extremely high dew point temperatures following a week of very humid weather for Melbourne. Precipitable water, which is a measure of total water vapour throughout the atmosphere, approached or exceeded December records in Central Australia, South Australia, Victoria and Tasmania. A Special Climate Statement will be produced for this event.